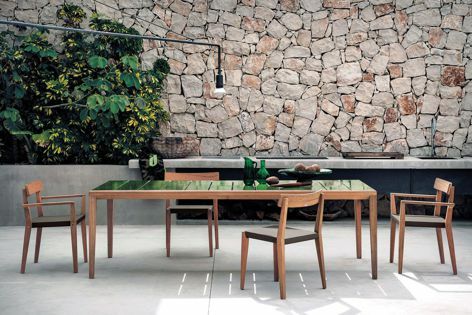 Teka outdoor dining collection by Roda includes the teak 171 chairs and 174 table featuring an optional glazed gres jade finish. Designed by Gordon Guillaumier, Teka is an innovative new collection by Roda that combines both natural and high-tech materials to create a unique furniture collection. Teka’s teak construction is both elegant and highly resolved. Its upholstery elements are made from luxurious, high-quality outdoor fabrics, which are offset by unique slatted glazed ceramic panels in Teka’s stunning table tops.